I recently got the chance to try out some Emmi Caffè Latte's and was set the challenge of creating something Christmas themed and I thought I would turn these into little lanterns. The best part about this craft session was getting to try a range of different flavours. My favourite was probably the Vanilla Latté from the 3 above flavours that I tried, it was really creamy and had a mild flavour so not too strong for people who like their coffee on the milky side. The cappuccino cups are actually perfect for this craft session, as they already look Christmassy. I decided I would keep the outside as they were rather than taking the wrapper off because I love how rustic these look. For these lanterns you will need some empty Emmi Caffè Latte Coffee Cups, red tissue paper, scissors, sellotape, a craft knife, a pen and some battery operated candles. Firstly, I marked off some circles which I intened to cut out. You can draw stars, circles, dots or whatever takes your fancy. I then very carefully cut these circles out with the craft knife ensuring I kepy my fingers away from the inside of the cup so I didn't cut myself. The cups are very easy to cut into so I didn't need to put my hands anywhere near the inside where the knife was. I then cut some tissue paper and lined the inside of the coffee cup ensuring I covered the holes. You can sellotape this down if you wish, however I just scrunched it around the edge. I then added my battery powered tea light. Due to the tissue paper, it was a lot safer to use this than to use a real tea-light which could potentially melt the coffee cup and burn the paper. These are really easy to pick up, I bought 3 for £1 in Poundland. I love how the light flickers through the holes, the red just makes it feel really Christmassy. I love the final look of these lanterns and they were so quick and easy to create. They are also safe to leave sitting up on a shelf due to the battery operated candles and these would even look nice in a child's bedroom flickering away. I bought my coffee's from Tesco and Sainsbury's and you can find these in the chilled section of most supermarkets so make sure you try these. 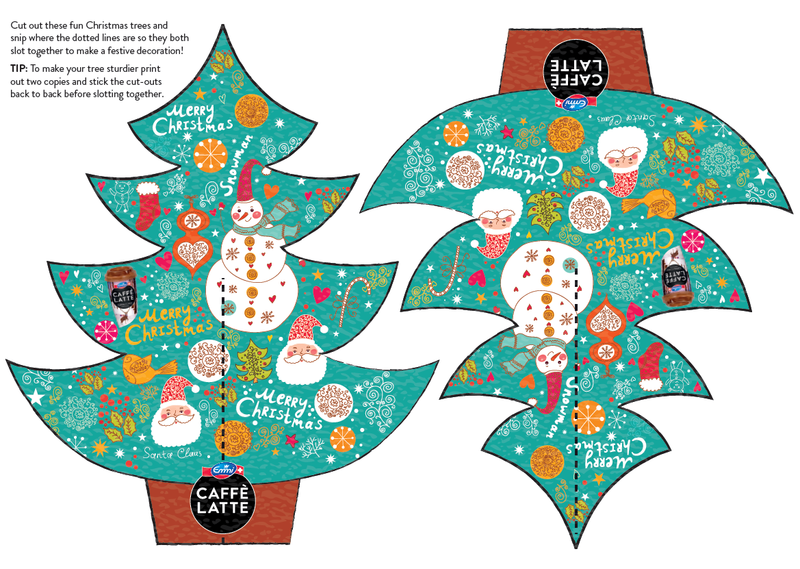 The guys at Emmi Caffè Latte have also very kindly provided a make-your-own Christmas tree template. Simply print this off and cut this out. This would be perfect to have at home or on your desk at work! Check out Emmi Caffè Latte on Facebook here to keep up to date with the latest news and offers. *I was provided with the Emmi Caffè Latte Coffee's free of charge in order to create these lanterns. All views expressed are my own and I was not influenced in any way.